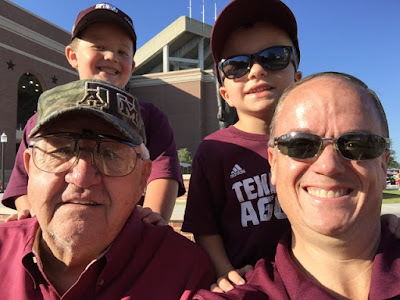 In mid-September, John and his Dad took the boys to their first home Texas A&M game of the year. We also went on this past Saturday, and they will get to go again with their Dad and PawPaw in November too. 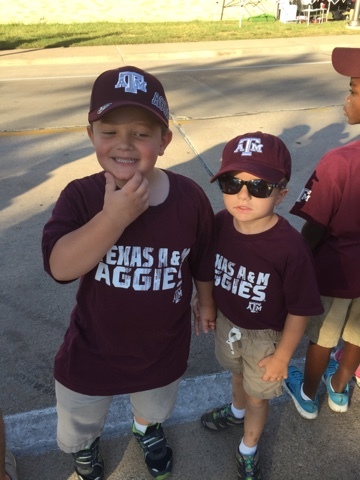 They had a good time, but it was REALLY hot - so they only made it through to see the band perform at halftime. 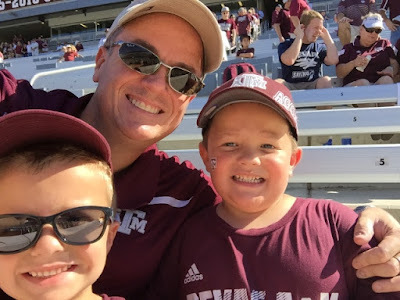 They are pretty much obsessed with all things about the Aggie Band right now, and knowing that their Daddy played with them when he was there is even more exciting. They've added a toy trumpet and saxophone to their Christmas lists -- which I may regret greatly come Christmas. It's pretty cute though, and I think that their interest in music is nice. I hope to find them a way to start learning how to actually play some instruments in the next couple of years. These 4 are such a crazy set, but they love each other fiercely. I am so glad that they get to share this with their Daddy and grandfather. 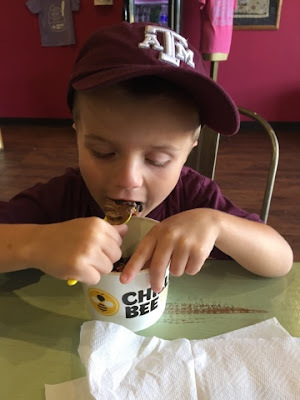 They are surely making memories for years to come, and it's a beautiful thing that they can capture it on the iPhone camera -- so they can watch it over and over again on YouTube too! They were waiting for Spirit Walk which is where the Aggie Band leads the Football Team in to the stadium -- they get to high five the band members on their way in to Kyle Field. 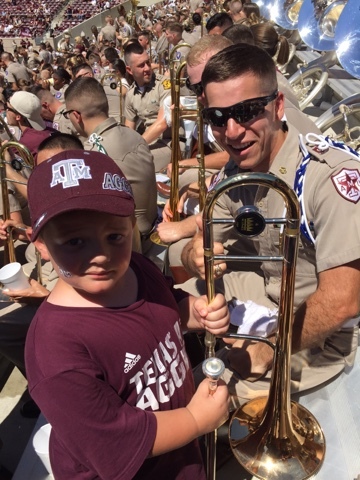 Oddly enough, Tyler is more interested in the band than the football team... 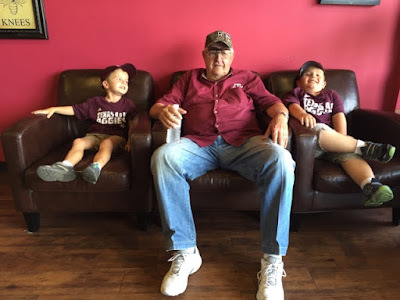 He got all of the football player's autographs earlier in the summer, but I think that he would be more excited if he could get the band player's autographs! 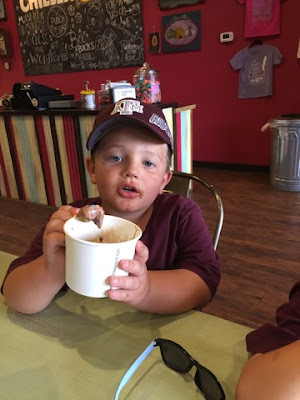 Since it was so hot, they also went for ice cream after they stopped off at Double Dave's for pizza rolls. I think it's safe to say that a good time was had by all! Tyler even fell asleep on the way back home. 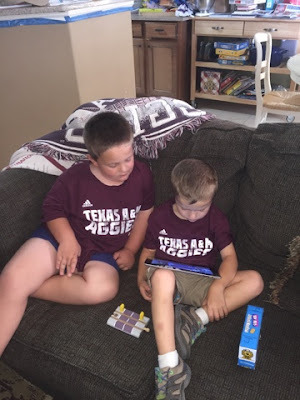 The game started at 11 that morning, so they still had some time after they got home to relax -- and we got to see a rare moment where the boys sat together to watch a movie together on the iPad. 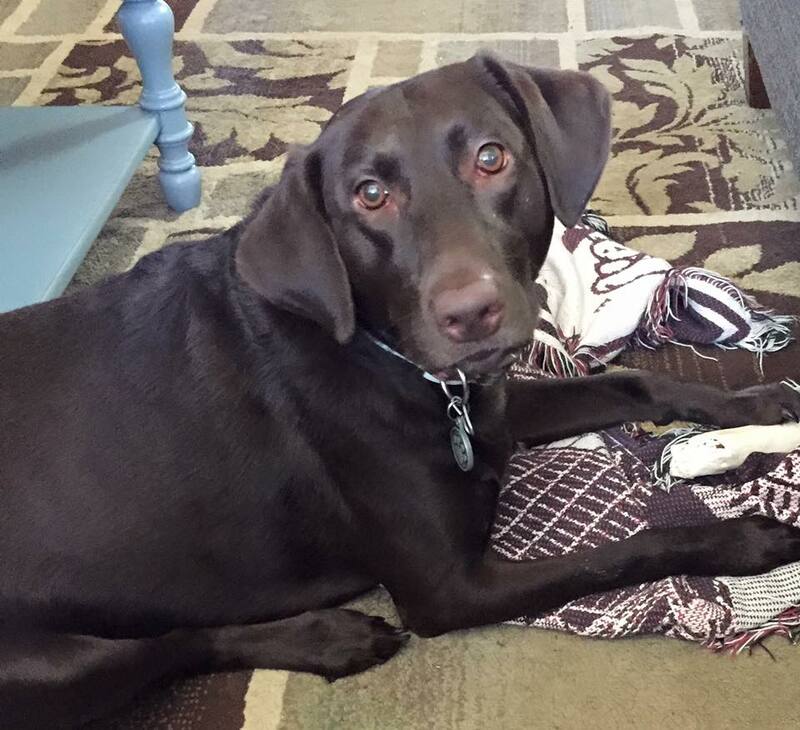 I just love those two to pieces, and when they get along so well like this -- it just makes me smile.